Three amazing books for me this week! I am soooooo very excited to start The Evolution of Mara Dyer. I love Noah! 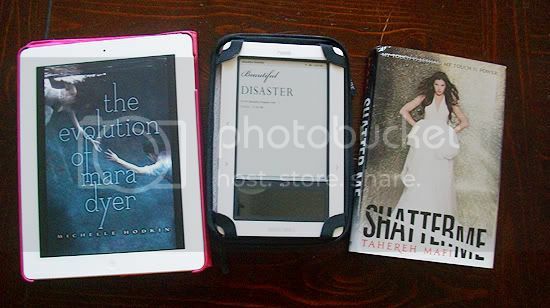 I still need to read Shatter Me and I've been interested on Beautiful Disaster too. Will wait for your reviews. Shatter Me is really good, and I'm so jealous of the second Mara Dyer book! The first was so good, so crazy! Hehee I think everybody does that - they have to have their own copy of books they love, i know i do. I absolutely loved shatter me, and have my own copy... but I still might buy the newer version of it when unravel me comes out... because i have OCD lol Great haul! Ooh nice! Haven't read these but hope you enjoy all your new reads! I also snagged Beautiful Disaster. Chat once we both finish obviously. I am holding off purchasing Shatter Me until the release the new covers because, hello, they're beautiful! Great, amazing, drool worthy mailbox this week! Everyone is getting Evolution it seems! Funny, I seem to be the only one who didn't love the book (or Noah!) But great books! Can't wait to see what you think of Beautiful Disaster; people either love it or hate it, it seems! Beautiful Disaster sounds interesting! I still need to finish reading Shatter Me, oi! All 3 of these look awesome!! I loved and adored Shatter Me too! And I got Beautiful Disaster this week too and I'm so excited to read it! I got The Unbecoming this week so I'll finally be able to start the series. Awesome books! Loved Shatter Me. And I just got Beautiful Disaster today so I'll be putting that on my next Book Haul post. Mara!!! You're going t loooove it! I really need to read Shatter Me! !